Global Food Colorants Market size was over 60 kilo tons in 2017 and is anticipated to surpass USD 4.7 billion by 2024. Shifting preference towards colored products due to flavor perception will drive the food colorants market growth. Edible color utilization to enhance the visual appeal and texture of the items are a key factor enhancing product penetration. High product adoption in the gourmet dishes along with favorable government regulations will expand the product application scope. Growing population and increasing disposable income in emerging nations will fuel product demand in the beverage industry. Shifting preference towards RTE products will augment product use in several items. For instance, in 2016, North America RTE market was estimated over USD 39 billion. Moreover, expanding consumer knowledge on approved food colorants additives drives product penetration over the forecast timeline. Dairy & frozen products market is growing rapidly owing to the rising awareness pertaining to the health benefits from the milk and its derived products among the youth population. Key properties such as high calcium content and enriched with vitamins & minerals will proliferate the market size. Surging inclination of the Millennials, Generation Z, and Boomers towards the products providing clean label, high protein, and low sugar will promote significant growth in the food colorants market. Natural food colorant base such as saffron, turmeric, paprika, annatto and beetroot are gaining popularity owing to its safe consumption and zero synthetic properties. Additionally, increasing number of health-conscious consumers will positively influence the business growth. According to retail giant Tesco, organic product sales including natural colors has risen by 15% in 2017, consumers are looking at labels and certification before purchase, thereby fueling product growth. Extended list of approved food grade additives by FDA and the EU accompanied by efforts to introduce novel natural colorants will positively influence demand. Though, fluctuating cost and availability with respect to raw material and stringent regulations to attain clean labeling may hinder the market growth. For instance, FAO has regulated the limited usage of synthetic color in the dairy, snacks and bakery industry due to their harmful consequences on human health. Synthetic food colorants held the majority share in terms of volume, the product accounted for around 45% of the demand in 2017. Allura red, sunset yellow, tartrazine and indigo carmine are the majorly consumed synthetic colorants variants. Low price, extended shelf life, stability and easy availability in bulk form are major factors fueling product demand. In addition, preference for synthetic colors such as blue and green from the beverage industry will aid market penetration. 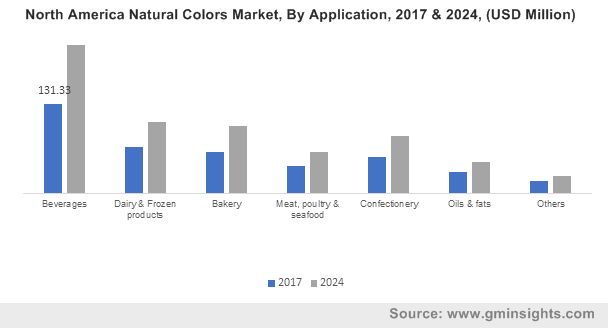 Natural food colorant market size is projected to surpass USD 2 billion by 2024. The product is sourced from minerals, vegetables and fruits. The number of health-conscious consumers have grown exponentially over the years, thereby instigating a demand for organic products including natural colorants. Additionally, growing awareness of safety concern policies pertaining to clean labeling augments product penetration. Powder form dominated the overall demand with a revenue share of over 65% in 2017. Versatility, ease of use, color consistency and bulky utilization are key factors fueling demand. Moreover, these product forms have a higher shelf life when compared to liquid form and offers more control in terms of decoration application than traditional liquid coloring. Liquid form is anticipated to grow at over 6% from 2018 to 2024. Key properties including easy availability in several grocery & departmental stores, lower cost, and high pastel coloring will proliferate the growth for liquid form. In addition, compact packaging and convenient usage for the end consumers in the form of plastic squeeze tubes and pouches will further propel the business expansion. Dyes emerged as the preferred type in solubility segment and is anticipated to register over 6.5% CAGR up to 2024. These soluble are available in granule, powder and liquid form. The product demand is driven by bulk usage in bakery, dairy and beverage applications. The versatility provided in achieving wide-range of color tint and inexpensive nature has positively influenced product penetration. Lake solubility is projected to surpass USD 1 billion by 2024. Lakes are primarily manufactured from the dye by precipitating it with a metallic salt. Key features such as high adaptability & versatility, high stability, availability in several concentrations, and effective oil solubility will fuel the demand for lake colors in the food colorant market. In addition, upsurge in the bakery & confectionery industry owing to the rising demand of cupcakes, cakes, chocolates, and candies among children across the globe will further foster growth for the industry size. Food colorants market size from beverage application is estimated to exceed USD 1.5 billion by 2024. They are extensively used in carbonated soft drinks, alcoholic & non-alcoholic beverages. For instance, in 2015, global beverage market was estimated over USD 915 billion liters. The vital role played by color in the purchase decision for beverages is a major factor propelling product utilization. Furthermore, innovative product developments such as color concoctions, unusual color and taste blends arousing consumer curiosity will boost demand. Dairy serves as another key application for the industry accounting for more than 15% of the industry share in 2017. Edible colors are vital for elevating the visual appeal of dairy products, thereby influencing consumer buying behavior. Moreover, development of edible colorants which can adapt to the varying pH levels and temperature exposure of dairy products will bolster food colorant market growth. North America and Europe emerged as the major markets in terms of revenue generation. Both the region together accounts for over 55% of the industry share. Rising demand for artisanry products coupled with favorable regulations from food safety associations are influencing regional growth. Moreover, consumer willingness to spend on natural products offered art premium pricing will offer lucrative opportunities for industry players. Asia Pacific is set to witness strong demand with a CAGR at over 7% up to 2024 in terms of revenue. Burgeoning processed snacks consumption along with increasing processed food trade has positively influenced regional growth. Growing demand for ready to eat products in major economies such as India, China and Australia will drive product demand over the forecasted timeframe. MEA food colorants market is projected to surpass USD 200 million in the forecast period 2018 to 2024. Rising awareness pertaining to the safe consumption of naturally derived colors in various edible items will foster opportunities for a significant business expansion. Factors such as easy availability of raw materials comprising of fruits & vegetables and increasing safety concerns among the consumers will influence the growth for product portfolio. In addition, rising spending capacity & value for money concerns of the consumers coupled with the growing trend of canned and packaged FMCG items will further augment the food colorants market in the region. 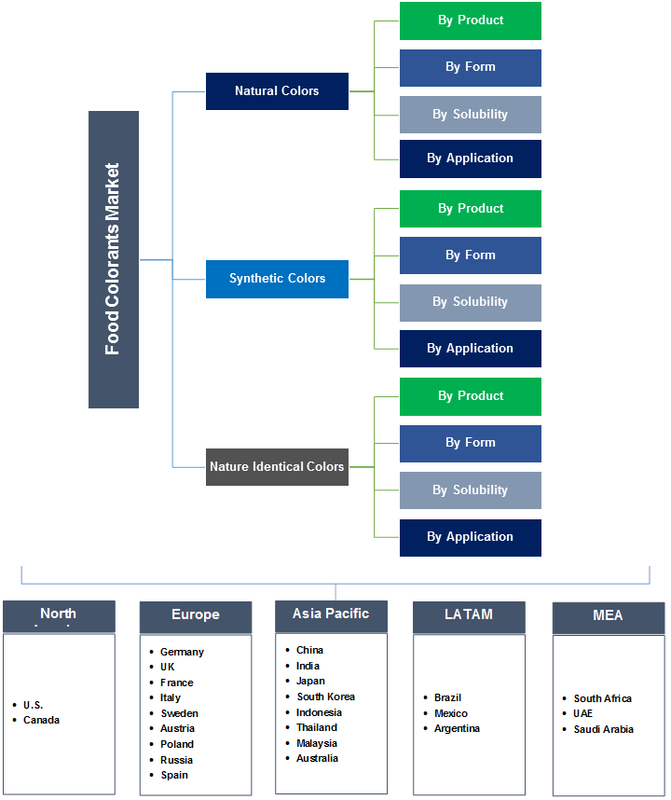 The global market share for food colorant industry is moderately consolidated in nature. Major manufacturers include BASF, DSM, CHR Hansen, Sensient Technologies, GNT group, DD Williamson, Naturex, Cargill, Sethness Products and LycoRED. Mergers & acquisitions, R&D investment, product innovations are major strategies implemented by industry players to gain market share. Companies are also involved in expanding their presence across the value chain to attain a greater profit margin. For instance, in February 2018, Sensient Technologies acquired the natural color business of GlobeNatural which is a leading natural ingredients company in Lima, Peru. The acquisition will provide the company to expand and innovate the natural color supply chain portfolio. Food colorants are additives used to enhance the visual appeal of edible items. Edible colorants are primarily used to compensate for changes in color that occur during processing and storage. They are extensively utilized in the bakery, dairy, beverages, meat and savory applications. Increasing consumption of processed items owing to a rise in disposable income and lifestyle changes will stimulate robust market growth.